I almost bought this print because the colors brought me cheer earlier this month (when traveling for the funeral). But I put it back…. I really do NOT want to bring home one more item – even if beautiful…. so I took a Photo to soak it up this way…. Sometimes I forget how beautiful bridges can be – and looking up at this bridge (on the way to Niagara Falls) I was reminded of how wonderful it feels traveling across some artsy bridges – design that surrounds us everyday. The Brooklyn Bridge became a recurring theme in Joseph Stella’s work because it deeply MOVED him inside. This bridge has inspired many artists over the years…. and the Italian immigrant, Stella, made many small studies of the bridge and then gave us five major oil paintings. Go here to see another Stella version of the bridge and to explore a watch and listen guide…. In 1899, Monet painted different views of a smaller bridge – his wooden footbridge at Giverny. He ended up with 12 paintings and this one here is noted for the vertical placement- the flatness of the bridge anchors the setting in a way that invites us in and allows us to possibly get moved (or pulled in) by those lily pads and bit of reflection….. Earlier this month I showed you some brief tutorials from the talented watercolor painter Rex Brandt (1914-2000). For this digest I had to share one of my favorite Brandt’s called Evening Rendezvous. I love when watercolor painters add their name and title to the piece (see lower right of painting). Art Collector’s Mark and Janet Hilbert donated Rex Brandt’s “Evening Rendezvous” to Laguna College of Art and Design –here. And here is another Evening Rendezvous from a different artist. I saw this hanging at a place in Buffalo and it looks like watercolor, but it is actually acrylic on canvas. I really wondered about this piece – and especially wondered the actual location. This next image is special to me because isn’t a good conversation a true gift in life? Oh indeed it is! And when you share a good convo with someone it can stay with you for a long time. I first heard the word “conversate” a few years ago when we used to watch Judge Judy. We heard the word and looked it up…. we discovered the word “conversate” has been around since at least 1829 (here), but it has become popular in use because of certain songs and everyday usage. The art that is found in clothing is often overlooked – and this dress from the late 1800’s reminds me of a look that was popular during the 1970’s….. maybe without the extra skinny waist. Do you agree? And thanks to Miss G for her post about exploring the year 1892 that led me to that old artsy dress image. I also thought this dress would coordinate nicely with the count’s ruby-red vest…. ha! #1: 90 Days of Art with artist John Beck McConnico – John has done three art projects for charity (here). I chose Soma, 5:26 p.m. to share because it reminded me of the Throwback post above (Day 83: Terry, 1981). Also, John’s watercolor skills remind me a little of Brandt’s skilled style. #3: Shari Blaukopf of The Sketchbook (here) was mentioned by Helen C. and I just had to feature this artist blogger. Not sure if you ever heard of the street artist Alec Monopoly. He makes Monopoly themed street art in cities like New York, Los Angeles, and London. I wanted to feature some of his colorful images in this digest. Alec layers social angles into his work and he uses anything from spray paint to epoxy to newspaper. More info about Alec Monopoly is here and here. Have you ever wondered what an original blueprint for the Monopoly game looked like? Here is a framed reproduction of a blueprint from 1935. Last year, we bought our boys some Monopoly Bookshelf art. They have lots of different options – and here is an example (we did not buy this – but the bank idea is fun). Have a great day – and be back soon with leftover STREET SHOTS from 2016! February 26, 2017 at .. Very good collection of art works and many different forms too! I really like artsy bridges set. I like architecture works and bridges are great example of it – love metal or event wood bended into different shapes – some curved and some straight put together. I immediately like Monet’s bridge painting. It is just easy to fall or moved into it. Hi YC – your wood comment reminded me that a lot of wood art is “in” right now…. at least around here. Hi M – yes – the trip went well – and the blueprint is a actually a copy- but truly a great way to allow folks to have a version of such an important document…. Love this post. So much to digest in one sitting. I will be coming back to look more and more. 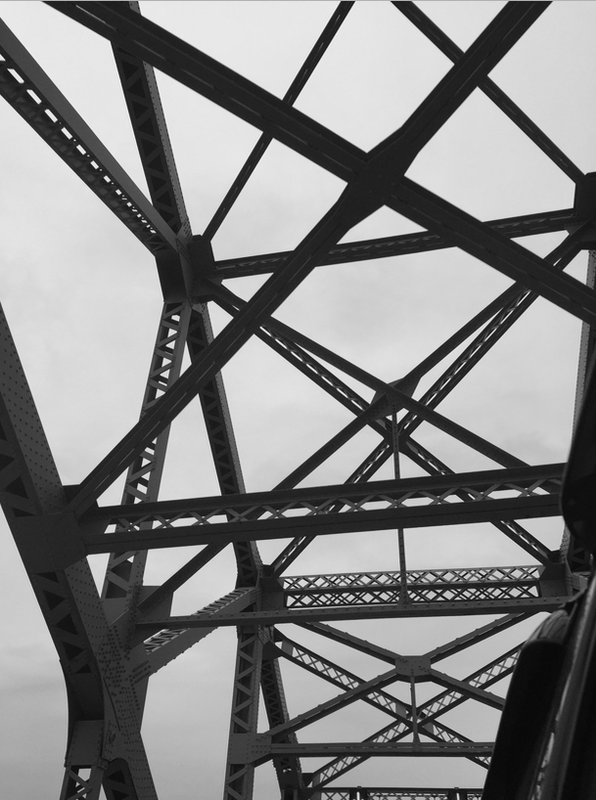 I always look up when crossing a bridge – carefully if I am driving of course – getting the perspective right is a challenge for me. The other art will be looked at closely later. I like the photos of conversating. Old photos always draw my attention. Thanks for a lovely time. and thanks for exploring the digest and my spell check does not like the word conversate either, but it was used in formal writing in the 1800s and maybe some updates are needed…. oh and here is another picture of the same bride that I liked- but I included the other one here because I felt like the thin vertical lines went with a vertical vibe in many of the art pieces here, ya know? laughing pretty good at the bride part – thanks for that! and brain sounds like a fun nickname….. I deeply loathe the term “conversate.” It always seems like just lazy English since it’s created by making a verb of the noun “conversation.” Pointless, since there already is a verb for that “converse.” I have no problem with new words — English is much richer for its ability to absorb newness, but I hate laziness. “conversate is a back-formation, a type of word made by removing a portion of an existing word (such as the suffix). Thus, escalate was formed by shortening escalator; televise comes from television, and donate was made from donation. There are many hundreds of words in English made this way, but some people will forever look askance at words such as liaise (formed by back-formation from liaison). February 27, 2017 at ..
A marvellous post – I have never thought of bridges as a form of art before so this was very informative and interesting. Lovely to see Norah Colvin featured here as well. Thanks Robbie – and cheers for Norah! Y., I loved the Rex Brandt picture, and the one from Buffalo (mystery subject). Thank you as always! I look forward to your next post! thanks very much – and I will be checking in with the Cinderella entry – appreciate your patience. Hi Yvette, You’ve packed a lot into this post. The first painting is beautiful with its gorgeous colours. I can see why it cheered you. I also understand why you took a photo instead of taking the real thing home. There comes a time when there’s just too much stuff! I love your collection of bridge photos and paintings. Of course my favourite is Monet’s painting. One day I want to visit his garden! I’ve never been a big fan of Monopoly but enjoyed the collection of art. First – I love bridges and they will always get a thumbs up from me … but what was really noticeable to me from this post is how diverse the creative mind can be. There is something for everyone. Jude reminded me that tomorrow is Pancake Tuesday in advance of Lent, so maybe that’s the day! well maybe…. and have one for your blog friends…k? I love bridges – excellent post. well Dan, I almost linked to one of your post that featured bridges…. but I link you enough – hah! and thanks for checking out the post. March 1, 2017 at ..
March 2, 2017 at ..
March 7, 2017 at .. The Bridge of Stella – Daring! And Rex Brandt -great contrast! Feel so accomplished today – finished the text for a book about revelation and creativity. A question to you – It is about including revelation in one’s creative approach (creativity in general, not only the visual arts, but also music, dance, etc.). I don’t want it to be labeled as a Christian book., but yet you know me. What is your take on it? Are there other words that say the same as “revelation?” In the book I have made clear that the source of creativity is the Creator. March 15, 2017 at ..
April 9, 2017 at ..
April 11, 2017 at ..
April 17, 2017 at ..